Silky straight skin weft hair extensions are the straightest hair texture with a smoothness that gives the hair a sheen finish. Silky Straight Skin Weft Hair Extensions... Will They Blend? Blending your skin weft extensions is important for a seamless look. Silky straight skin weft extensions (aka tape in hair extensions) are a great option for those with naturally straight or wavy hair as the glossy texture is an accurate match. If your hair has a curl pattern and you intend to add a few strips of tape hair extensions, you may find the silky straight texture too shiny to blend with your natural growth hair; in which case something like the relaxed straight textures (Yaki) might be a better blending option. This doesn't mean it won't require maintenance, but that it has a tendency to look shinier than naturally curly hair that has been heat or chemically straightened. Silky straight tape in hair tends to start from 8 inches and tend to peak around 26 inches but you can find longer lengths....if you search.... far... and... wide. 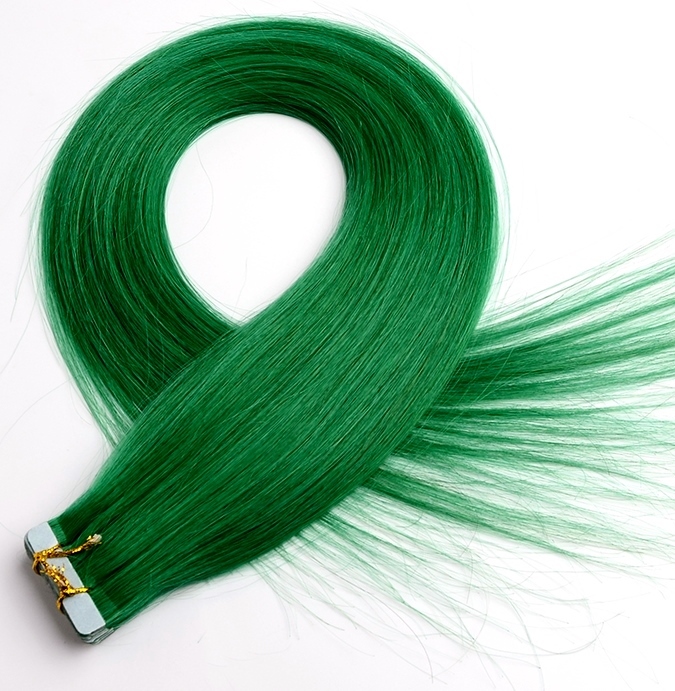 If you're a tape hair appreciator then you'll be aware that you can buy skin weft extensions in remy weft hair and non-remy weft hair and there are brands of non-tangle-non-remy too (don't ask, that's a whole other guide for a whole other time). Our top tip for choosing your length is decide first whether you want it cut into a style after you purchase it and if you're unsure about which hair lengths complement which face shapes, then check out our wigs by face shape guide - yes it says wigs but it's more of a hair length by face shape guide. 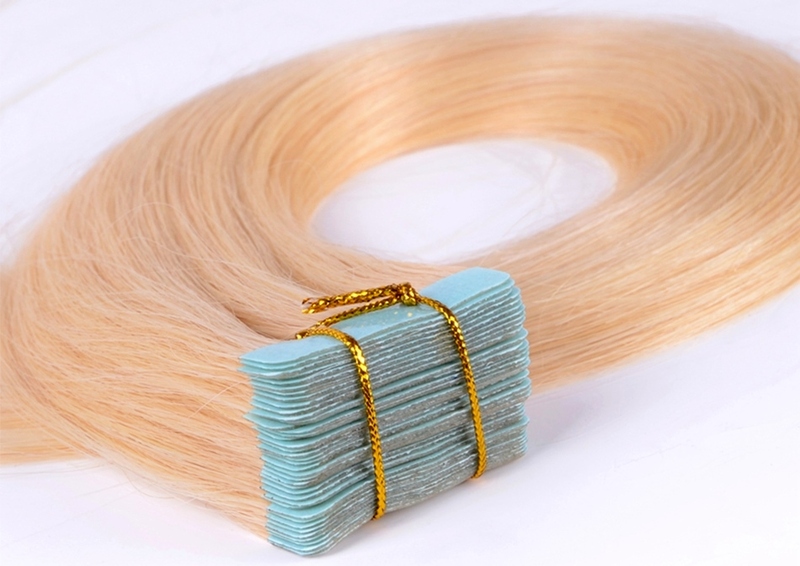 Silky straight tape in hair extensions come in single pieces or sets of 20 or 40 pieces (there are versions that have fewer or more per set). Unlike regular tied hair weave extensions, skin weft extensions are usually sold as single length sets. Colours for silky straight tape hair range from jet black to platinum blonde and everything else besides including ombre, dip-dye, pastels as well as bright colours. If you're unsure about which colours would suit your skin tone then check out the skin tone and hair colour guide. See our in-depth guide for Caring For Tape Hair Extensions and use these top five tips as a starter. 2. Use a leave-in conditioner or deep condition your skin weft hair (human hair) every two weeks to repair and strengthen the hair. 3. Keep tape in hair extensions (and your growth hair) moisturized, using a light moisturizer that's free from mineral oils. 4. If the tape hair becomes frizzy, or seems dry at the ends then apply hair oils to smooth and nourish the tape hair this works best when the hair is slightly damp. 5. You can also use a dry shampoo in between washes to keep oily scalps under control. Silky straight skin weft extensions sorted! If you want to keep up to date with the next guide about skin weft extensions, hair weave, hair extensions, wigs and hairpieces then join our blog, or check the Hair Extensions Q&A section.